Rainbow lorikeets are colorful members of the parrot family that are native to Australia and the South Pacific. These popular pets are smaller than many other species in the parrot family; along with their curious, social disposition this makes them easy pets to keep. They are also fairly easy to breed in captivity with the right preparation. Pick out a male and female pair. 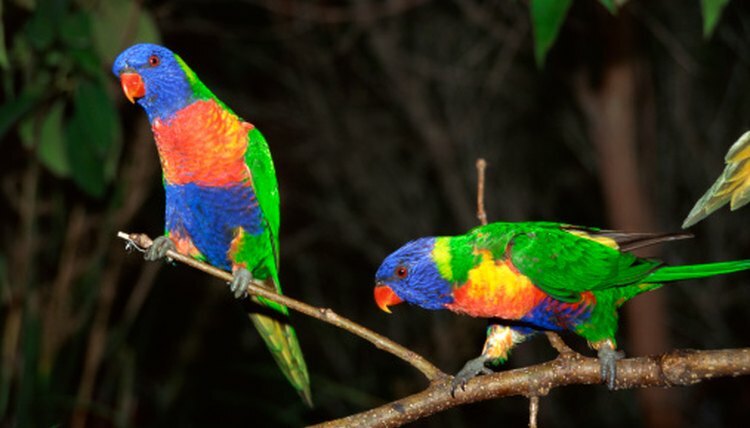 Male and female lorikeets have identical coloring, and the only way to tell the gender of the birds is to have a veterinarian perform DNA testing. This is usually done by taking a blood sample or by testing the bird's feathers. Place them in a properly sized cage. As members of the parrot family, rainbow lorikeets need plenty of room; if the cage is too crowded, they will not breed. For a pair, the cage should be at least 36 inches tall, 60 inches across and 36 inches deep. Supply a well-rounded diet. When encouraging lorikeets to breed, be sure they have a daily supply of fresh water and plenty of food, including a morning offering of a wet food mix developed for lorikeets, as well as fresh vegetables including broccoli, beans and peas. These tropical birds will also thrive on a variety of fruit such as mango, apple and pear. Clean up any uneaten food in the late morning. Have a dry seed and food mix available for snacking throughout the day. In the evening, offer a small amount of wet food or a single piece of fruit. Attach a nesting box. Rainbow lorikeets are not particular about what kind of nesting boxes they prefer. Attaching an L-shaped or rectangular nesting box that is large enough for the birds to fit comfortably inside will suffice. A log-shaped nest is also usually accepted. Putting it on the outside of the cage will keep plenty of room inside open for perching and stretching their wings. Give them time. Rainbow lorikeets can breed at any time of the year, and reach maturity when they are about a year old. Most pairs will lay one or two eggs, which will almost always be viable. When deciding to breed lorikeets, research some of the color mutations that have been developed in captive birds. Breeding these uniquely colored birds can provide an alternative to the standard rainbow lorikeet. Keep a close eye on the young birds to ensure that the parents are not plucking at their feathers or becoming aggressive toward their young. If this happens, consult a veterinarian -- they will be able to advise whether or not the chicks should be removed from the nest.